Good marketing can help increase profits and bring customers to your spa. 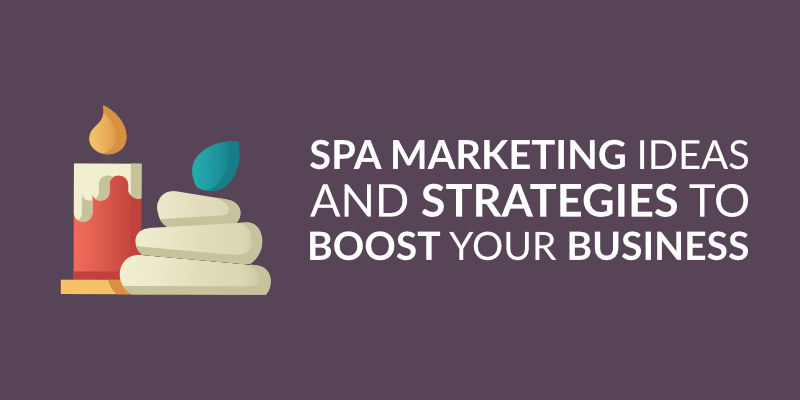 In this article, we’ve laid out some spa marketing ideas that are easy to implement and —most importantly — effective. It will guide you all the way through from planning your campaign to bringing in customers. First up, let’s take a look at two important things you should consider before starting: what your goal is, and who the target is. The first step to any successful marketing campaign is to be clear about what you want to achieve. You should not be afraid to be very specific with this goal. Make new people aware of your spa. Encourage people who already know about your spa to visit. Persuade existing customers to spend more. Target customers who haven’t used your services in a while. All these ideas have the same ultimate goal: increasing sales. However, the strategies you use to achieve this will be very different. Of course, it is possible to have more than one target at the same time. Also, some strategies you use will hit two objectives, even if the second wasn’t the primary one. For example, offering a new deal to existing customers could encourage them to spend more, while also increasing the chances that they will tell friends. This could result in new customers. The second part of the planning stage is to create a buyer persona or personas. This is a made-up person whom you will target your marketing efforts at. Essentially, it is the type of person who would benefit from a trip to your spa. While the persona is made-up, to be effective, it needs to be based on real life. Luckily, building a buyer persona isn’t hard. A good one will include as much detail as possible such as gender, age, location, education, income level, family status, occupation, what they buy, what motivates them to buy, and what stops them from buying (read more about buyer personas here). Customer information you already have on file. Data from your Facebook business page. Details from Google Analytics about who is visiting your website. You can make more than one buyer persona if you notice different groups of people seem interested in your spa. For example, your business may be popular with both wealthy retirees who visit your spa at the weekend, and high-earning workers who come to relax in the evening. Either way, it is vital that each marketing strategy you use focuses on both your buyer persona and your marketing goal. Once you start marketing, most of your efforts will focus on getting people to book an appointment at your spa. Here are some ways you can make that process as simple as possible. The centrepiece of any online marketing strategy is your company’s website. Building a website has become much easier in recent years. There are plenty of services that let you quickly put a good site together including WordPress, Squarespace, and Wix. These services are affordable and easy to use, even without web design expertise. There are plenty of things to think about when it comes to building your site. 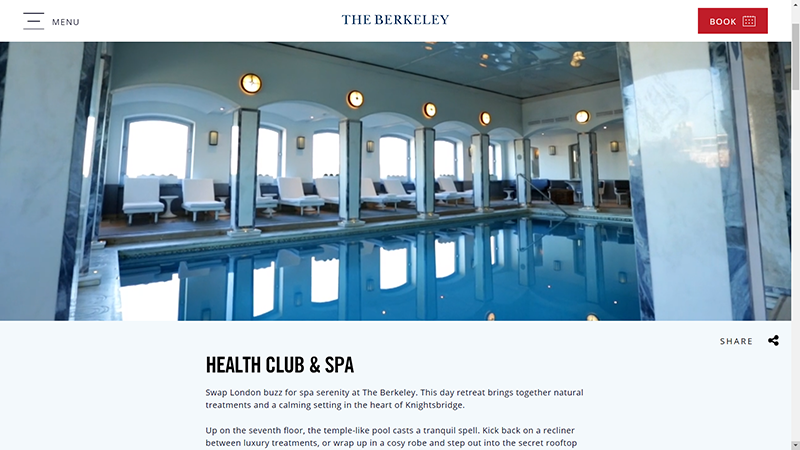 Let’s take a look at the site for The Berkeley Spa in London to get an idea of what makes a good spa homepage. The first image is the desktop website, while the second is three screenshots from the mobile site. The most important information is displayed clearly. The Berkeley keeps things simple which makes it easy for customers to get the crucial information they need. The website has lots of great pictures, a short introduction to the spa, as well as information about treatments. Booking an appointment is easy. The Berkeley website makes it super easy to schedule an appointment using an icon that sits at the top of the screen (more on this below). The site looks great on both desktop and mobile. Nowadays, more people browse the internet on mobile devices than on desktop computers. 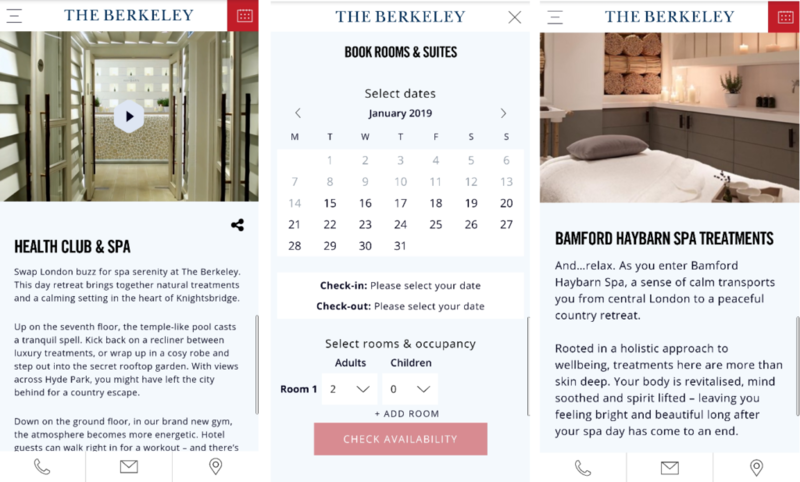 The Berkeley Spa website looks great on both mobile and desktop, with all crucial information displayed on both platforms. Making it as easy as possible for people to book appoints at your spa is crucial. Because of this, your website should include a way to let people book online. According to Fit Small Business, 25 percent of millennials only book appointments online, while 35 percent of clients like to schedule appointments during non-business hours. To take advantage of this at your spa, you should consider using an online booking platform to organise reservations. There are plenty of services that allow you to do this, including Square Appointments, Bookeo, and Planyo. These services allow customers to book appointments with your business online. Every meeting is updated in the app’s (or your existing) calendar. Once a spot is taken, it will no longer show up. This means you won’t get double booked. All three services also allow your business to take bookings separately for different employees. You can accept payments in advance and integrate the software into your website using widgets. Additionally, if you use Square Appointments, you’ll be able to integrate your booking system with Google’s reservation system “Reserve With Google.” This allows businesses to accept bookings directly from Google Search results. According to Google, Bookeo integration is also coming soon. As well as a website, it can be useful for your spa to have an app. An app can help you provide exceptional service to your customers and even increase sales. Much like email marketing (discussed below), building an app lets you contact people with a proven interest in your business. Here are some ways you can use an app to market your spa. We spoke about how important it is to make it as easy as possible for people to book an appointment with your spa. In-app booking is another way you can simply the experience. You can also set up appointment reminders which are not only helpful to customers but could also result in fewer cancellations for your business. You can even send out reminders to regular customers you haven’t heard from in a while. Encouraging repeat business can be an easy way to increase sales as you don’t have to reach new people. An in-app loyalty card or points card could make it more likely that existing customers will keep visiting your spa. Apps provide a direct line of communication to your customers via in-app notifications. These can be used to deliver messages about special offers, promotion, or business updates. Of course, you need to make sure you don’t abuse this, or the notifications may annoy clients. Providing information about your services can make it easy for people to find out about the services you offer and could encourage new bookings. It’s possible to combine in-app notifications to introduce new services to your customers. While building an app may sound difficult, App Institute’s app builder makes it easy for small business owners — even those without technical expertise — to create an app for their business. You can change everything from the appearance to the content contained within the app using a simple drag and drop system. You can even build an app for free, so you can see exactly what the service offers. Try it out here. Once your spa has a website, the next step is to attract people to it. Google is likely to be the place where many potential customers start their search for a spa. 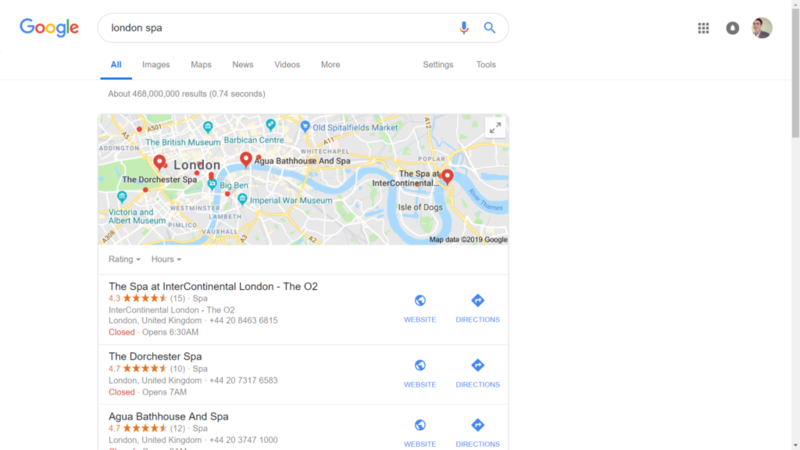 The first thing you notice when you search for spas in certain areas is that Google Maps dominate the search results page. Likewise, searches for “spas near me” will bring up the same map. From here, it is easy for searchers to find a spa close to where they need one. Because of this, you need to make sure your spa shows up in Google Maps if you want to give people the best chance of finding it. This means you’ll need to set up a Google Business page for your spa. These free pages help you control how your business shows up when it appears in searches on Google products. When you create a Google Business Listing, you’ll have to enter your business’s address, opening hours, website, contact details, and photos. The listing will show customer reviews, and you’ll be able to respond to any comments you get. Whenever you update the listing, it will update across all of Google’s services. 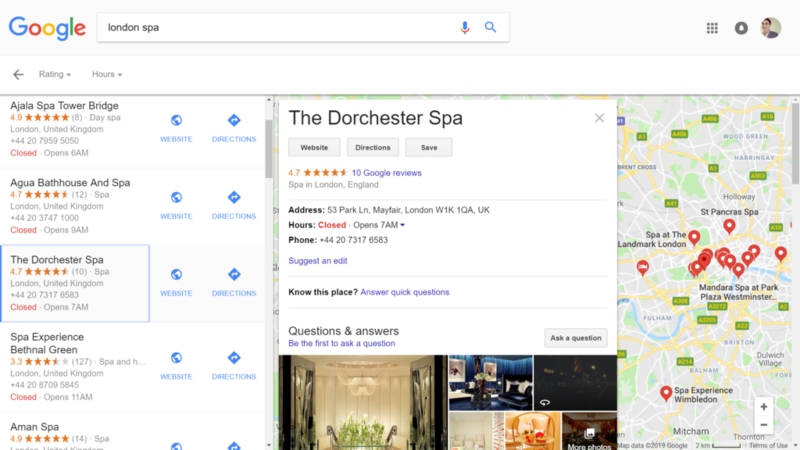 Below is an example of a Google listing for The Dorchester Spa as seen within Google Search results. If you want to give your business a boost when it comes to Google Search results, you can always choose to advertise your spa using Google Ads. 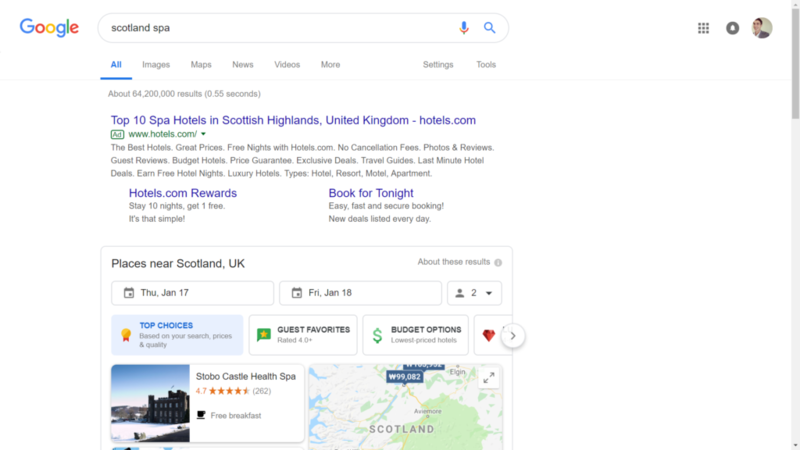 If you use Google Ads to promote your spa, the advert will appear at the top of the search results, even above the Google Map listings. This will ensure that when someone searches for a spa in a particular area, your business will appear. If you can combine this high position with an enticing enough listing, you may be able to get people to your website, and ultimately to your spa. Having said that, Google searches for spas don’t reveal many businesses taking advantage of this opportunity. When an advert did appear, it always seemed to be for Hotels.com, as seen in the image above. This may suggest that other spas have decided Google Ads isn’t worth the investment. Alternatively, it could point to an opportunity for a spa that can use the service effectively. Either way, it doesn’t cost much to experiment with Google Ads, so could be worth trying out. The other place you can get your spa seen on Google is the actual search results. Unfortunately, when it comes to search terms like “London Spa”, results from major publications dominate the first page. This means it may be tough for a spa to rank highly and compete with these established websites. Nonetheless, there are still opportunities for long tail searches. 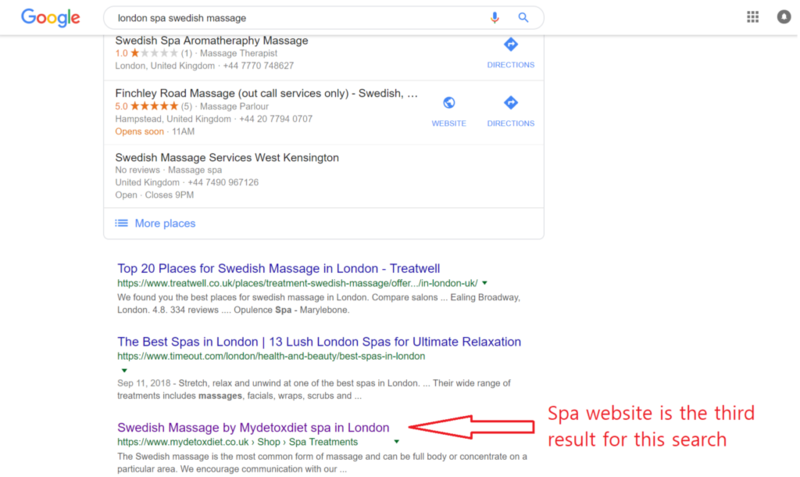 Search results for specific treatments (“London Spa Swedish Massage”) and more specific areas (“Mayfair Spa,” “Islington Spa”) do still feature independent spas on the first page. You stand more of a chance for ranking for one of these keywords. The best way to do this is to think about what sets your spa apart and what your buyer persona is most likely to be searching for. Even though the total number of search results will be much lower for the more targeted keywords, the people seeing the results will be more likely to need what you provide. When putting an SEO strategy into place, the first thing you need to do is decide on the keywords you want to rank for. Following this, you need to create high-quality content around these keywords, while ensuring that plenty of links go to your site and that your website’s meta tags are all keyword optimised. While it sounds complicated, it isn’t too hard. If you need more information, we have an article that explains all about how to optimise your website for SEO that you can access here. Alongside search; social media, email, and simple word of mouth are all great ways to get people to your site and increase your spa’s customer base. Social media can help you reach and interact with potential customers. There are plenty of different social media platforms out there, and the one you choose to use will most likely depend on your buyer personas and marketing goals. Here are some ways you can use social media to reach customers. The easiest way to get your spa in front of a high number of people on social media is by using paid ads. Sites like Facebook allow you to make your ads highly targeted so that you can direct them right at your buyer personas. Another good thing about social ads is that most services offer ways to see exactly how your campaign is performing and make changes as necessary. They are also super cheap to get started with. Facebook allows you to set a daily budget of only $1. This means you don’t have to risk much by using an ineffective ad. Another way to spread the word on social media is to create content that you share via your business page. If people like your content, they may also share it, giving you free advertising. It is also possible to pay to boost posts that are particularly effective. The key to making shareable content is to make it genuinely interesting or useful, not something that is promoting your brand (at least, on the surface). This can be anything from blog posts to pictures to video. The latter option performs exceptionally well on social media. According to Twitter, tweets with video get more engagement than tweets without. 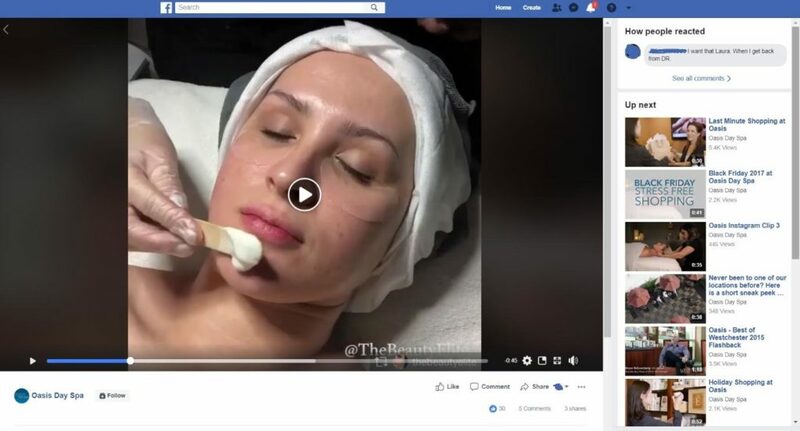 This video of an Elemis Biotec Pro-Radiance facial earned the Oasis Day Spa over 1,000 views, 30 likes, three shares, and five comments! Working with social media influencers with huge follower counts can get your spa in front of a large number of people. However, encouraging your customers to share your business can be just as effective and cost much less. While you may not end up with your brand in front of quite as many people, a personal recommendation can be more influential than a paid advert from an influencer. There are many ways to encourage your customers to post about your spa. Perhaps the easiest is to offer a discount or a freebie to anyone who makes a post. Alternatively, you could optimise your offerings to be as shareable as possible. Make any food or drinks you serve as visual as possible, so people are more likely to share it on Instagram or Pinterest. Research suggests that people are more likely to share things that paint them in a positive light. You could take advantage of this by offering VIP treatments or holding special events and inviting your most loyal customers. If you make your customers feel special, they may be more likely to spread the word about your business on social media. When someone makes a booking with you, it can be useful to ask them for an email address. This is because when you have an email address, you have a direct line of communication which can be used to market your services. Other ways to collect email addresses include offering free content on your website to people who sign up. Alternatively, you could provide free wifi at your spa to customers who enter their email address. When done correctly, email marketing has a significant Return on Investment (ROI) — around 119 percent according to some research. This is because everyone you contact is either an existing customer or has an interest in your business. Send an email reminder about your services. Send an offer such as a free service upgrade or a discount. Run a competition for a free service. Send newsletters containing updates about your business. A combination of the above. For example, a newsletter with a discount code. One of the most important things when it comes to email marketing is ensuring that your emails don’t come across as spam. Falling foul of spam laws could even land you with a hefty fine in some areas, including the UK. To avoid this, you should ensure that your emails put your customer first and contain information they are interested in. Also, ensure that when customers provide you with their email addresses, they have permitted you to contact them for marketing purposes. Finally, you should contain an unsubscribe button to allow customers to opt out of receiving your emails if they want to. Software such as MailChimp can make it super easy to run a campaign, design emails, and organise your subscribers. For an in-depth look at email marketing, check out our guide here. Customer referrals are an easy, low-cost way to get more customers. The most important way to get referrals is to provide an excellent service that people want to talk about. However, referrals can be encouraged by giving benefits to those who recommend your business. For example, you could offer discounts to both the referring customer and the new customer. Alternatively, you could offer upgrades, free services, or give customers with a large amount of referrals VIP status at your spa. When choosing which benefit to provide, you’ll have to look at your buyer personas to see what is likely to entice them to recommend you. If you are a high-end spa with wealthy customers, discounts may not be attractive and could even damage your brand. We hope this article has provided you with some inspiration for your spa’s marketing campaign. It may seem like a lot to take on but following these steps will give you a good grounding in how to market your spa. If you need more inspiration, you can find out more about marketing a spa with this article on five features your spa or salon app should have.